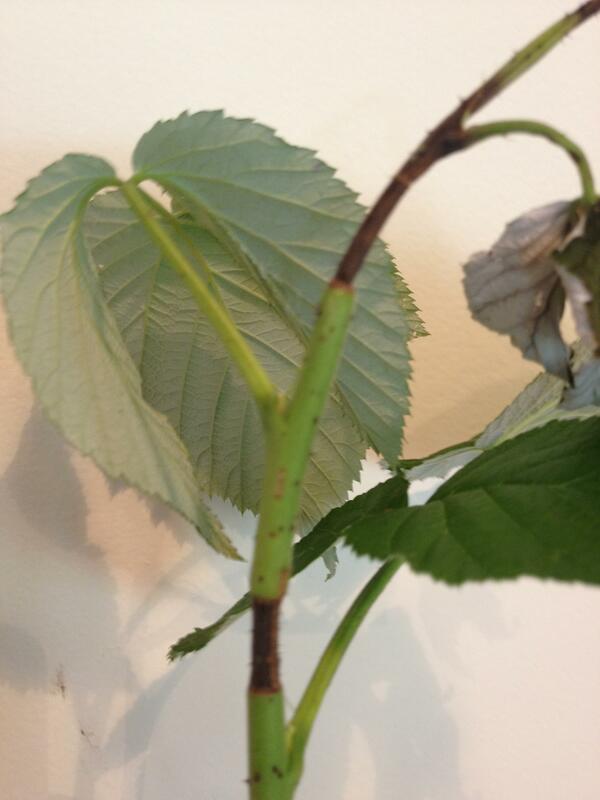 What is the disease or organism that is causing this issue with my raspberry plants? the stem is affected for about 1 inch normally near the tip. The tip is dead/wilted and there seems to be a distinct patter of a ring at the top and bottom of the "eaten" area. Probably is Spur Blight. It's a fungal infection. To avoid it, don't prune canes except to remove them completely. Remove pruned material from the property, elsewise burn it thoroughly. The infection pool comes from leaving old and diseased canes over winter. Avoid watering methods that put water on the canes and foliage, it's especially active after late spring/early summer rains. Usually the infection starts near a bud or a leaf base. The Spur Blight fungus is controlled by Lime Sulfur application and certain Streptomyces bacteria. Not the answer you're looking for? Browse other questions tagged diseases pests or ask your own question. Is this a desease or pest on my pepper-seedlings? Raspberry leaf curl disease? Can this be treated or prevented? Cucumber with bacterial wilt, what to do to save other plants? What is the disease that affects my plants?